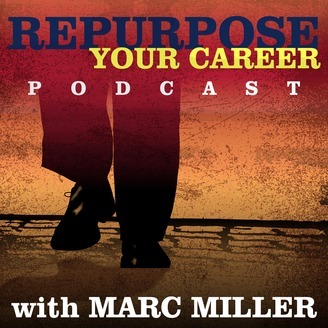 Repurpose Your Career podcast brought to you by Career Pivot is a podcast for those of us in the 2nd half of life to come together to discuss how repurpose our careers for the 21st century. Come listen to career experts give you proven strategies, listen to people like you tell their stories about how they repurposed their careers and finally get your questions answered. Your host, Marc Miller, has made six career pivots over the last 30 years. He understands this is not about jumping out of the frying pan into a fire but rather to create a plan where you make clear actionable steps or pivots to a better future career. .
[1:44] If you are enjoying this podcast, please share it with other like-minded souls. 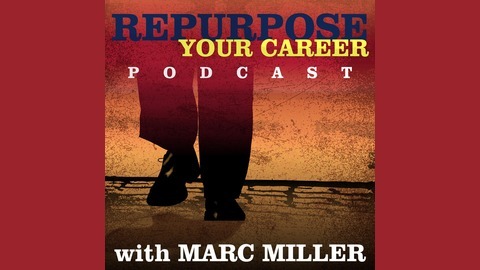 Subscribe on CareerPivot.com, iTunes, or any of the other apps that supply podcasts. Share it on social media or just tell your neighbors, and colleagues. The more people they reach, the more people they can help. [2:06] Next week, Marc will be interviewing Patti Temple Rocks, author of I’m Not Done: It's Time to Talk About Ageism in the Workplace, a great book on ageism. Marc thinks you will like this great interview. [2:54] If you are interested in being on the release team and get early access to chapters in the new edition, go to careerpivot.com/rycteam. Marc hopes you enjoy this episode. [3:12] The pre-release chapter of “Learn to Embrace Creative Destruction.” In his book, Antifragile: Things That Gain From Disorder, writer Nassim Nicholas Taleb explains the problem of turkeys. A butcher feeds a turkey for 1,000 days. Every day that that turkey’s life remains constant confirms the surety of his current existence. [24:28] Please come back next week, when Marc will interview Patti Temple Rocks, author of I’m Not Done: It's Time to Talk About Ageism in the Workplace, a great book on ageism.